Provide for a fair and safe competition that encourages the development of good will between nations. Provide a standard measure to identify the people who exhibit the most skills in moving a kayak on the most challenging parts of the wave. Judges expect to see changes of direction of the boat on the wave. Such manoeuvres would include bottom turns, re-entries, cutbacks, floaters, aerials, tube rides, top turns, late take-offs, trimming and stalling, etc. How radical they are, followed by the amount of control and commitment put into each of them, will determine how high they will score. In particular, judges are looking for the bigger, more radical, manoeuvres, with ‘rail to rail’ surfing, rather than single rail surfing. It is important to note, a surfer has to complete a manoeuvre for it to be scored. It will not score well if they lose control or are not able to continue on the wave. Wave selection is a critical factor for a surfer in their heat. The waves selected will dictate the manoeuvres they are able to perform. There is less emphasis put on wave size in small to medium conditions due to the fact that the best waves may not necessarily be the biggest. However, in a contest with big wave conditions, a large part of the criteria would be the size. A surfer should be prepared to demonstrate the greatest commitment to the critical part of the wave. A surfer does not automatically score high because of wave size or quality. What the surfer does with the wave is a more important criteria. Long Boats: More emphasis is put on large carving type maneuvers with longer rides. Note that the longer the ride, the more potential time to score points, so the higher potential score, in both categories. Length of ride is not scored. In poor surf judges concentrate on surfers who are utilizing the mini power-pockets on the wave with explosive moves that are normally timed to occur at each of these spots on the wave. Higher scores will occur if maneuvers are being linked directly to another without paddling all the way to the next section. 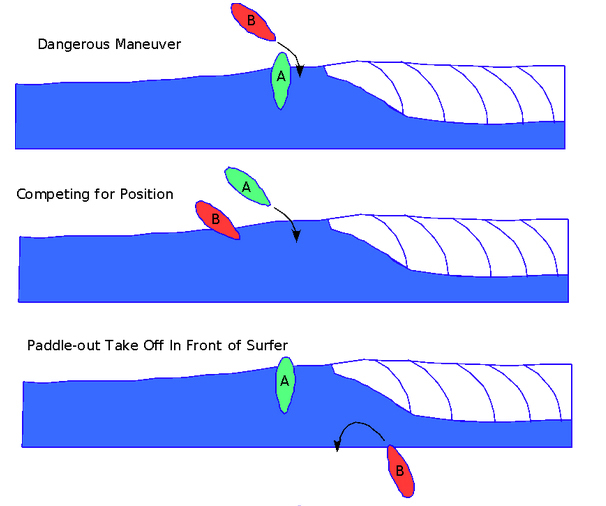 Single Peak (Left & Right Breaking Wave) – The surfer considered to have the inside position at the initial point of take off has unconditional Right of Way in the direction he chooses by making an obvious turn. A second surfer may surf in the opposite direction. 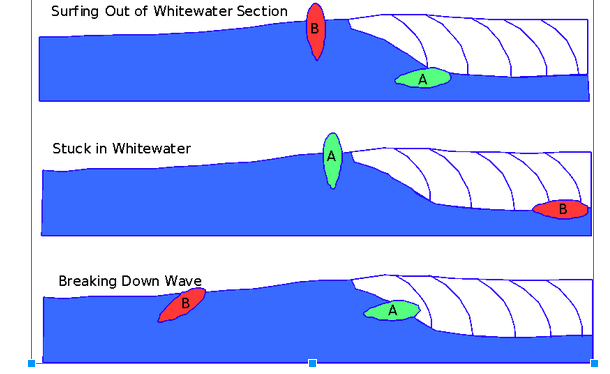 Beach Break (Multiple Random Peaks) – Two separate peaks that eventually meet then both surfers are required to kick out of the wave or straighten out to avoid collision. The surfer who is farthest inside at the initial take off point is entitled to that wave for the duration of his ride. However, if a surfer takes off on the white water behind the first surfer, he will be penalized if the surfer taking off at the peak is forced to pull out and loses the wave. (Note, this does not prevent behind-the-peak takeoffs started in green water). The Right of Way rule says that the surfer who is farthest inside at the initial take off point is entitled to that wave for the duration of his ride. Judges expect that there will be jockeying for position on some waves. However, paddling in front of, around, or behind a competitor who has inside position and is about to take off on a wave, in order to impede the competitor and take possession of a wave, is considered to be snaking, and will result in an interference call. Competitors must have read and signed the waiver form. It is the responsibility of the competitor to report to the Beach Marshall prior to the start of their heat. Failure to comply will result in possible sanctions by the competition committee. Any competitor surfing in the designated area, while another heat is in progress, will be subject to sanctions. Competitors are responsible for entering their heat wearing the correct color of bib, as determined by the Beach Marshall listings, where they receive their bib. Failure to comply will result in sanctions. Competitors may have assistance emptying their kayaks and re-launching while the heat is in progress. But if you are rescued by the rescue boat or ski, this will be the end of your heat. Points already gained will stand, but no more points can be earned in that heat. The standard punishment for interference with 2 wave scoring is the competitor judged to be at fault, loses half their lowest scoring wave from that heat. If a competitor commits 2 interferences or more in one heat, this will be the end of their heat. All competitors have a right to protest. The cost of this will be set by Organizer at the start of the contest. The protest committee will decide the result of the protest. No protest will be heard against a judging problem. Only clerical errors will be looked at. No video footage will be submitted. The protest committee will be appointed and displayed before the start of the event. The event competition committee retains the right to disqualify any craft, if its shape is deemed dangerous and disallow any other equipment that does not meet the competition committee’s interpretation of the rules and its equipment specifications. The event committee retains the right to disqualify or enforce sanctions on any persons they feel to be pushing the rules too far, being un-sportsmanlike, etc.